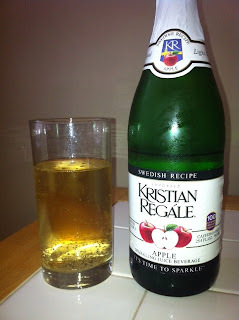 Janessa At Thrifty Nifty Mommy Introduced Me To Kristian Regále & I Love That It's 100% Natural & Has A Light, Crisp Taste! It Is Also Gluten-Free, Caffeine-Free & Non-Alcoholic, So My Entire Family Can Enjoy This Beverage! Out Of All Of The Delicious Flavors, I Think Apple Is My Favorite! :) I Am Excited To Take Kristian Regále To Our Next Family Get Together & See What Everyone Else Thinks! Kristian Regále Also Has Recipes On Their Website, I'd Like To Try Making A Float Or Fruit Smoothie! Buy It: Visit Kristian Regále & Use The Store Locator Or Purchase It From Amazon! Win It: One Lucky Reader Will Win A Case Of Kristian Regále Like The One I Received Above!